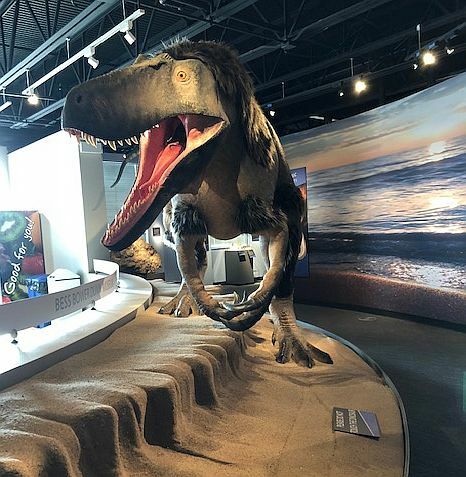 A full-sized Dryptosaurus dinosaur greets visitors at the Bess Bower Dunn Museum of Lake County and they’ll learn that such a creature likely roamed the area 67 Million years ago. In the next room, they’ll see and can touch a huge fossil rock found in Lindenhurst formed about 420 million years ago and they’ll learn the area was covered with water and sea creatures. 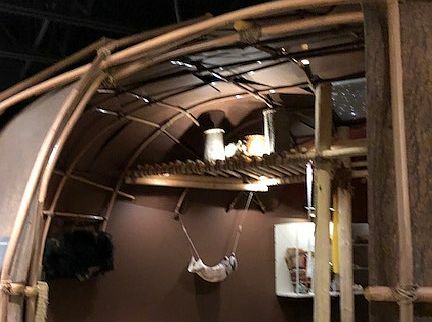 As visitors move through the museum they will come upon and can sit in a large wigwam and see objects from the mid-19th century but hear about Native Americans who lived in the area 120,00 years ago and those who still live in the area. 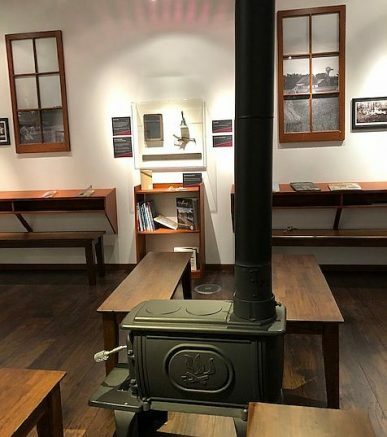 Walking further into the museum, they’ll find an old-fashioned classroom of a one-room school house where McGuffey’s Second Eclectic Readers sit waiting to be opened on the desks and a small, stovepipe furnace reminds youngsters that central heating came later. Further along are uniforms, a drum and other artifacts and stories of local citizens during the Civil War. Lodge posters and a real lotus boat, used to navigate among the lakes’ flowers show vacation trends of a bygone era. Then, a Waukegan railroad depot sign invites visitors into a room with industrial, agricultural and other interesting items from the past ranging from a 35mm motion picture machine to a brewing company’s advertisements. Items on loan from local historical societies fills the special exhibit gallery in Lake County’s tribute to the Illinois Bicentennial 1919-2018. They are items featured in the book, “200 Objects That Made History in Lake and McHenry Counties,” is going on through early January. What everything described in brief here is better seen in person. 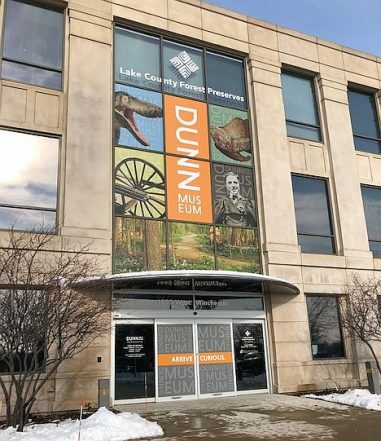 They can be found in the recently opened Dunn Museum, formerly known as the Lake County Discovery Museum that used to be in the Lakewood Forest Preserves. Some items were moved but many more were taken out of storage now that the Lake County Forest Preserves have a large, new building with excellent museum space on West Winchester Road, Libertyville. Of course visitors of all ages are welcome weekdays except Monday and weekends but the museum also has noon tours a couple of times a month for adults on their lunch hour and craft days for families with children age 12 and younger during vacations. So if looking for a museum on a smaller scale than what is downtown Chicago put the Bess Bower Dunn Museum of Lake County on the family’s “let’s check it out” list. BTW Bess Bower Dunn was Lake County’s first official historian. The museum is in the Lake County Forest Preserves building in an office-industrial complex so the best way to find it is at museum planning directions. The Bess Bower Dunn Museum of Lake County is at 1899 West Winchester Rd., Libertyville, IL 60048. For more information call (847) 968-3400 and visit LCFPD Museum.